Jetzt is a study on movement between falling and landing, the creative potential of the body in a state of instability. Thelonious Monk’s stumbling rhythms and surprising harmonic sequences forms the appropriate musical counterpart. Hauert’s pieces associate highly structured material with improvised movements. He explains: Improvisation is not just a tool used during rehearsal. It is also integrated into the performance. I am convinced that the body can discover through improvisation extremely intricate patterns of movement it could never imagine before, on its own. We have to be daring enough to carry the improvisation much further, without restricting ourselves to the normal movements the body is familiar with. This concept is superbly illustrated in Jetzt. 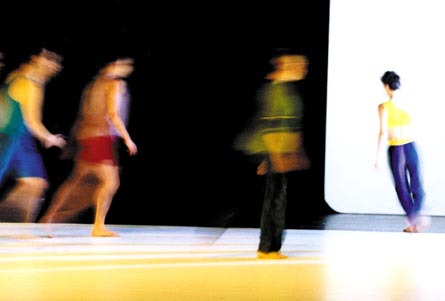 Hauert’s creation which was premiered in January 2000 at Luzerntanz, where Hauert was choreographer in residence. In this piece the dance composition is both extremely strict and unpredictable. Jetzt means now. No other title could make a clearer reference to the present. And Thomas Hauert draws extensively from it. While the dancers observe established laws they also seem to give in to instant mood swings they’re carried away by their breath, by an impulse they seem unable to control and that is a response to Thelonious Monk’s jazz music. This is extraordinarily lively music, rarely used in dance performances. In Jetzt the relationship between movement and music is thus highly harmonious, strongly suggestive. Monk’s music is neither narrative nor illustrative: it follows its own course, underpinning the dance and the choreographer doesn’t fail to pay tribute to it. The dancers stagger, twirl, traverse the theatre, fall and get up again, waver between centrifugal force and gravitation. Because Thomas Hauert and his company don’t satisfy themselves with exploring the corporeal mechanism of articulation and muscle, they also play with the weight of given parts of human anatomy, in search of a way to briefly escape gravitation. The projected images and films also participate in this search images vacillating in the background or on a white linen screen, at times cut out, at others altered. The body becomes the mobile tool of the union of art and nature, artifice and artlessness. The postures conjure up a limited or unlimited space, depending on the moment. No step looks like another. That’s the magic of Jetzt. The way the dancers sway next to each other, cross the space or gather like the components of a mechanism sometimes resemble a dispassionate movement study. But barely perceptibly a marvellous kind of humour and irony emerges. The dancers’ articulations limber up, their muscles react faster, their blood heats up, and audacity makes its appearance. On Monk’s music the dance becomes a relaxed walk, a whimsical play with speed. The dancers cling to each other like fractious children, their bodies trip over themselves. It is all brilliantly ordered and stunningly danced.